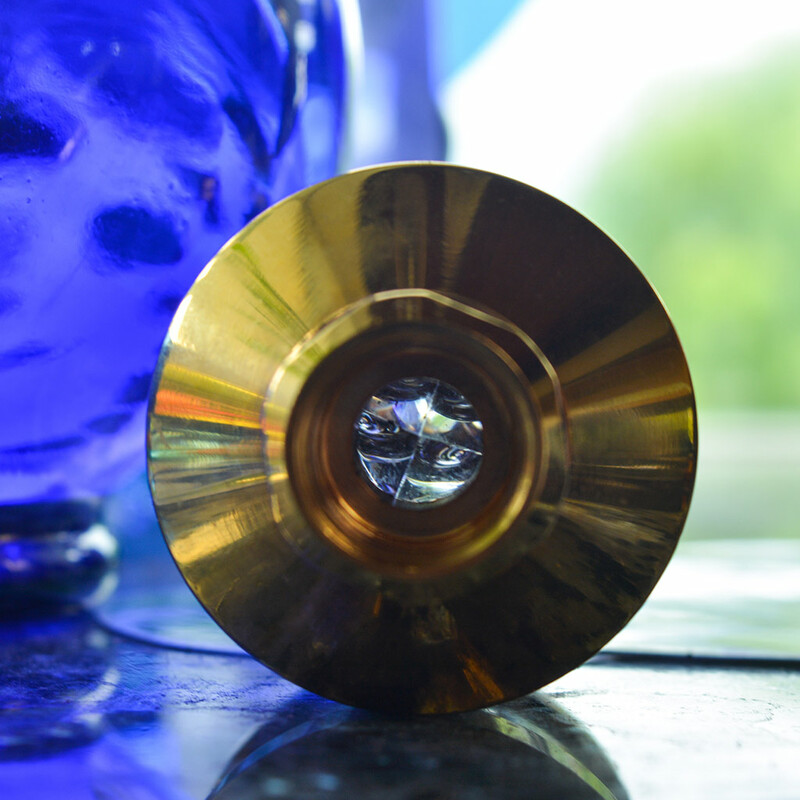 Featuring Sacred Geometry, Vortexing, Entrainment and Precious Gems to produce the finest Structured Water. Every measurement in these beautifully constructed devices is designed to evoke the energy of the Cosmos. Every drop of the water you consume is amplified with it! This is an amazing device for structuring your water! We are so excited to share this phenomenal device that truly structures your water. The difference of the water is immediately noticeable by taste and mouth feel. When we first read about the UMH Structuring Devices, there was definitely full resonance with the product just from the description…and now after trying it out for a year, we are definitely hooked! This is under sink version of this incredible device! It can be set up under your kitchen sink rather easily to your cold water line or after your water filter device. It is up to you how to set it up. We can help advise or you may contact a plumber to install. But it is rather easy if you know a little bit about plumbing. In the photos, we have included a comparison of the UMH Master and the UMH Pure. There is also a UMH Collection photo as well. 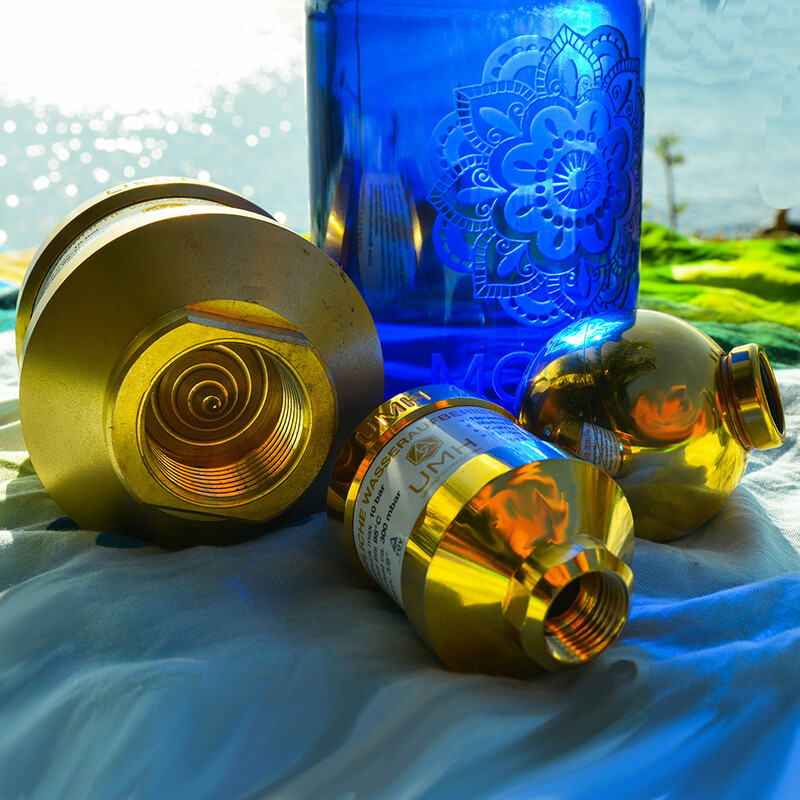 And one of the beautiful images includes the UMH Pure in front of our Genie Bottle…with the beautiful Blue Glass seen through the crystal in the structuring device! The shipping is included in the price, no matter where you are in the world! Please note, these will ship directly from our supplier and they will not ever be shipped with your Blue Bottle Love bottles or accessories. Guarantee & Warranty: 5-year warranty on function and device technology, 90 Day Satisfaction Guarantee or 100% money back. The UMH Pure contains highly charged water inside of it and this could freeze. Do NOT install outside in cold climates or in places where it is likely to freeze. Freezing is not covered by the warranty. Crystals are wondrous partners in healing because they gather, transmit and amplify energy. Comprised of quartz and silica, both major components of the human body, crystals have the capacity to transmute energy. The crystal composition in the Jivara allows you to have a super charged transmutation activator at your service. Feng shui experts around the world use crystals in windows as a way to support the magnification of harmonising energies in a home. Due to their unique composition, crystals capture and deflect discordant energy. Then, almost like magic, they have the ability to alchemically transmute discordant vibrations into gentle harmonising energy. Rose Quartz is a silicon dioxide mineral compressed over eons of time at extremely high temperatures and then cooled into a soft pink crystallization of energy. Around the world, Rose Quartz is considered to be the most powerful healing crystal. It’s a stone that more than anything else, opens, heals, and activates the heart chakra and intuitive centers of the body. Rose Quartz offers its healing properties to you through the Jivara. What makes Rose Quartz so powerful is that it acts as a strong magnifier of the heart—the body’s conscious feeling-center—and hence, Love. It supports us to get back in touch with Love when we are separated from it in addition to being a powerful harmonizer of the body’s subtle energies. Who doesn’t want to be drinking the energy of Love? What do you think would happen if your Water carried the resonance of the most life supporting energies available? Now, you can find out. With unique properties found in no other substance, an unknown origin, located in only one place on earth, and containing a molecule grouping observed nowhere else in nature, Shungite is a natural mineral with a bit of intrigue. Shungite has been called “the sensation of the 20th century,” and touted for its antioxidant properties. Shungite has been said to have the ability to neutralize the negative impact of electromagnetic fields such as solar, biofields, radio, anthropogenic high frequency electromagnetic frequencies, geopathogenic, and electromagnetic radiation. It is also known for its adsorptive, bactericidal, and catalytic properties. Shungite has been used in medical treatment since the early 1800’s, in providing purified water for the Russian army and its bactericidal properties have been confirmed by modern testing. Water resonating with Shungite is revered in Russian health communities where it is recognized for its ability to cure various illnesses including depression, stomach weakness, diarrhea, stones, kidney disfunction, and many more. Tiny organisms that consume toxins while producing vitamins, enzymes, organic acids, bioactive minerals and antioxidants offer one of nature’s finest symbiotic purification methods. Dr. Teruo Higo discovered a way to harness this power and transfer it to ceramics. He named his discovery “Effective Microorganisms” or “EM” for short. First offered in Japan in 1982, EM products such as EM Ceramics are now produced in over 54 plants and applied in over 120 countries. Found inside the Jivara, EM Ceramics have the unique ability to remove the pollution imprint from the memory of water through far infrared signals. Around the world, EM products are cleaning up chemically-impacted environments including polluted rivers and landfill sites and now they can be used to purify your Water. Please check out our Blue Love Home & Body Care products which also use EM to make our products Beyond Biodegradable! Every measurement in the Jivara is designed to evoke the energy of the Cosmos. The device itself contains the same angles and measurements as the Great Pyramid of Giza, the oldest of the Seven Wonders of the Ancient World, and the only one to remain largely intact. Pyramids are amplifiers used as a means to enhance energies. Many studies have shown pyramids create an energetic effect that prolongs life. For example, grains have been found in pyramids thousands of years later, curiously fresh and unaged. Pyramid energy creates negative ions, neutralises electromagnetic fields, balances and harmonises and in so doing seems to create something akin to eternal life. The magnificent life enhancing energy of the Great Pyramid can be transferred to your Water. Take a peek inside the Jivara to feel the Divine resonance you will be experiencing as you immerse your life in Sacred Structured Water. How wondrous would it be to have your water attuned to the same resonance as the Cosmos? Here is a great video which helps to explain and compare the 3 of the UMH structuring devices available. There are a couple more options, please inquire if you are interested to learn more.